Shrimp makes for a festive presentation at Kansas State University, where Camille Korenek offers up the seafood on rafts of cucumber. An Asian-accented marinade flavors the shrimp, watermelon balls make a juicy garnish and the watermelon rind is transformed into an accompanying slaw. 1. In medium bowl, combine vinegar, sesame oil, sugar and red pepper flakes. Divide marinade in thirds, using ¼ cup for rind slaw, ¼ cup for shrimp and remainder to brush on garnishes. 2. Marinate shrimp for 2 hours in the refrigerator; drain in colander. Broil shrimp for 5 minutes or until they turn pink; chill. 3. Scoop out flesh from watermelon and reserve for garnishes. Cut rind into 2-inch chunks of long strips. Slice 12 ounces of rind paper-thin on mandolin. Mix salt with thinly sliced rind and let stand for 10 minutes. 4. Rinse salt off rind and drain in colander. In bowl, mix drained rind with ¼ cup marinade. Refrigerate at least 30 minutes. 5. Cut ends off cucumbers and scallop edges. Thickly slice cucumbers into 24 rounds. 6. To assemble, place a cucumber slice on plate; top with ½ ounce slaw and sprinkle with black sesame seeds. 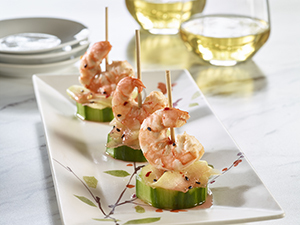 Top each crudité with a cooked shrimp; brush with more of marinade. Garnish plate with watermelon balls.